The Life of the Leader shares personal stories and leadership principles of an unsung hero who successfully applied his leadership skills and talents to change lives of hundreds of people both in South Sudan and Gambella Region of Ethiopia. 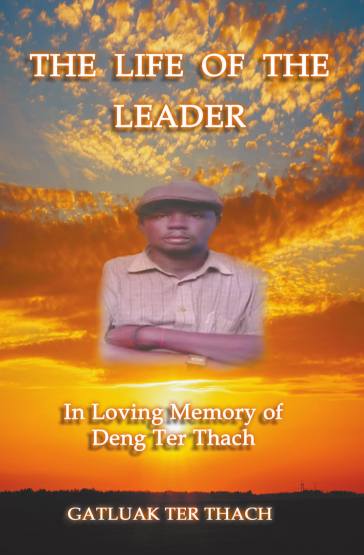 Deng Ter Thach, 45, who died on November 24, 2017 in Assosa, Ethiopia after a short heart related illness, attained remarkable achievements through hardwork and collaborations with many people across different races and backgrounds. His principles of success as a leader are shared by more than 100 people interviewed and provided their perspectives and experiences of Deng Ter Thach during six and half months long interviews. The qualities of leadership, which include planning, relationship building, visioning, changing, action taking, valuing, focusing, charisma and supplying, as shared by participants and grouped in chapters in the book, are the major reasons for his success. The recommendations and suggestions of how to tackle big issues and overcome personal, political and economic challenges are provided at the end of the chapter 10, and this book also incorporates encouragement and sympathetic comments from number of people across the globe. 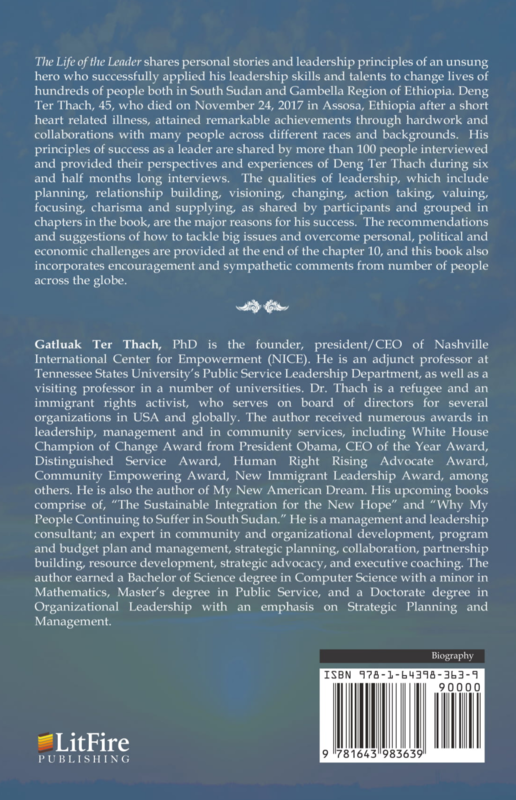 Gatluak Ter Thach, PhD is the founder, president/CEO of Nashville International Center for Empowerment (NICE). He is an adjunct professor at Tennessee States University’s Public Service Leadership Department, as well as a visiting professor in a number of universities. Dr. Thach is a refugee and an immigrant rights activist, who serves on board of directors for several organizations in USA and globally. The author received numerous awards in leadership, management and in community services, including White House Champion of Change Award from President Obama, CEO of the Year Award, Distinguished Service Award, Human Right Rising Advocate Award, Community Empowering Award, New Immigrant Leadership Award, among others. He is also the author of My New American Dream. His upcoming books comprise of, “The Sustainable Integration for the New Hope” and “Why My People Continuing to Suffer in South Sudan.” He is a management and leadership consultant; an expert in community and organizational development, program and budget plan and management, strategic planning, collaboration, partnership building, resource development, strategic advocacy, and executive coaching. The author earned a Bachelor of Science degree in Computer Science with a minor in Mathematics, Master’s degree in Public Service, and a Doctorate degree in Organizational Leadership with an emphasis on Strategic Planning and Management.